Prime minister Theresa May said she was "deeply disappointed" at Donald Trump's "unjustified" decision to impose tariffs on EU steel and aluminium imports. In a statement, Mrs May said UK's steel and aluminium industries were important to both countries and played a key role in US national security. Her reaction comes after Mr Trump announced he would impose a 25% duty on European steel and a 10% duty on European aluminium. “The US, EU and UK are close allies and have always promoted values of open and fair trade across the world," the prime minister said. "Our steel and aluminium industries are hugely important to the UK, but they also contribute to US industry including in defence projects which bolster US national security." Earlier, Cecilia Malmstrom, the EU trade commissioner, announced the bloc would be seeking to implement a number of retaliatory tariffs on American products by June 20. Ms Malmstrom said a final decision on what products would be hit with tariffs had not yet been made, but added that they would be from an already published list which includes the likes of Levi’s jeans, bourbon whiskey, cranberries and peanut butter. Mr Trump originally imposed the tariffs in March, saying a reliance on imported metals threatened national security. But he exempted Canada, Mexico and the European Union to buy time for negotiations – a reprieve that expired at midnight on Thursday. The director of trade body UK Steel, Gareth Stace, said he was “very, very worried” about the potential impact of a “double whammy” on British producers from the Trump administration’s decision. 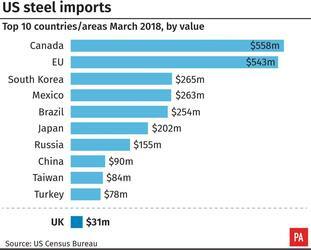 UK steel producers could be shut out of an American market where they sold around £350 million of exports last year, while also facing increased competition from a “tsunami” of cheap steel diverted away from the US, he said. Mr Stace said the EU should activate “safeguard measures” to prevent European markets being disrupted by a surge of as much as 25 million tonnes of steel diverted from the US. Labour’s shadow international trade secretary Barry Gardiner earlier warned the UK Government to “strongly respond” to the move. International Trade Secretary Liam Fox said in a statement that the UK would support any EU appeal to the WTO. Dr Fox said: “I have been very clear these tariffs are not justified. We have not ruled out counter measures and will support any EU appeal to the WTO. Former White House press secretary Anthony Scaramucci, also speaking to Radio 4, said that with Mr Trump there was “always room for negotiation”. Mr Trump had campaigned for president on a promise to crack down on trading partners who he said exploited poorly negotiated trade agreements to run up big trade surpluses with the US.